I’m excited about this week – it’s time for the 15th annual Amelia Island Book Festival, February 18-20, here in northeast Florida. I’m proud to be on the advisory board this year, and proud of the format changes that will help make it one of the best so far. Bestselling author Steve Berry is the headliner and honorary chairperson, coordinated this year's focus - An Amelia Island Encounter - Action, Thrills and Mystery, with all proceeds going toward promoting literacy to the students of our Nassau County Public Schools. The festival begins with the Kick-off Luncheon featuring a keynote thriller writer, Andrew Gross on Thursday, February 18, at the Amelia Island Plantation. Then that evening there are Teens Scenes: free events for middle and high school students can choose from among four offerings designed especially for young people and presented by noted authors. I’m helping out with the graphic novel event, featuring authors/illustrators Michael Regina and Jonny Jimison. On Friday, February 19, at FSCJ-Nassau Campus in Yulee, Steve Berry and his wife Elizabeth Berry will lead a workshop, Lessons from a Bestseller Writer. But my favorite is the festival's main event, the “Author Expo/Readers Extravaganza,” a day for all ages featuring more than 100 noted authors of all genres. With FREE admission and free parking, the Expo runs from 10 AM to 6 PM Saturday, February 20, at the Fernandina Beach Middle School Campus. I’ll have a booth there, and will also be part of a three-author panel on historical fiction. My author friends will also be there: Barbara Bond, Parker Francis, Lauren Gilbert, John Gillgren, Louise Jacques, Andrea Patten, L.M. Reynolds, Raffaella Marie Rizzo, Jim Weinsier, and so many more! Steps on the path to your royal brand In last week’s post I summarized lessons learned from royalty—the first personal branders—covered in my 7-part series analyzing their techniques. This post gives you the steps I’ve laid out in my “personal branding worksheet.” I will cover how to complete the worksheet in two posts because it will get too long otherwise. As noted previously, there are many ways to go about personal branding, and you could spend years and thousands of dollars perfecting it if you choose. But I believe for an individual, and specifically for authors, this method is a simplified and effective way to create a workable brand that will represent you and guide you for years to come. Which reminds me to remind you: Branding, like book marketing, is a marathon, not a sprint. Be sure you can love and live with what you create because it should last for many years. In any kind of communications activity, the first thing you need to know is who you are talking to, and what they need. Who is your audience? Depending on your work and the types of writing you do, you may have one audience, or you may have several. Are they distinct or do they overlap? What do they expect, both from you as an author, and from you as communicator? Think of one or two, or maybe a handful of individuals from your primary audience. What are they like? As an example, I write historical fiction, and my stories tend toward the hero’s journey and social milieu, and not so much toward battles and blood (although those are not completely absent). My readers are both male and female but a slightly higher percentage female. They love to read, like history and strong female characters. They want to be immersed in time and place, but also learn while they read. They are busy, smart and social. I must always have this target audience in mind when thinking about my brand, and it helps me decide how best to express it, where and when. You can go into much greater detail than this, and define subgroups as needed if you write in more than one and very different genres. How can you learn about your audience? And relax. It is not a perfect science no matter what the professional marketers say. In my case, I learned that some historical fiction readers were tired of the Tudor period and the proliferation of books on that era when so many other periods in history are not well covered. Also, I knew some readers are hesitant to invest an 800+ page novel. Who has time? I had heard complaints abut authors who overplay their research and include every detail instead of just what is important to move the story forward. So, I targeted those readers by setting my story in a different time period, making sure it was fast paced, under 300 pages, and selective in detail. The result was successful and effective, but now some of my readers tell me they love the story, but maybe it moves too fast and they don't want it to end. They want it longer. They love learning about a period in time they have not read about before, but normally would not have looked for it when shopping for a book. Perhaps I created a higher barrier to overcome in that readers aren't familiar with the period I’ve chosen or why they might want to read about it. But that’s okay, I know it is an exciting era, and highlighting this has become my challenge and my mission. Your brand is not really about what you do. It’s about why you do it. Steve Jobs said Apple’s brand was not about a company that makes computers. It's about a company that values innovation, passion, aspiration and simplicity. Apple’s products support people who have those same values. You write books? Great – a lot of people write books. Your readers are interested in WHY you write them, what you believe in that makes you tell the stories you tell. The values that are most important to you are the building blocks of your brand. There are so many values, a good way to start narrowing down is to pick from a list. Some companies ask their customers to pick values from a list that they believe describes the company, then they use those words in their brand materials. Sometimes they'll choose different words to help highlight different values they want their audiences to recognize. I found a link listing more than 400 values, but you’ll find many similar lists if you type “values list” into your search engine. Look through and pick out the things that are most important to you, then narrow that list down to 10 or 20 words that you think define you as a person and as an author. Be honest. As we learned from Napoleon, it doesn’t pay to pretend to be something you are not, and it will be difficult to maintain a false façade. With your short list, narrow it down again to those five or six values that define you but are also important to your audience. These are areas where you may be able to connect with them on a personal level. Values like Leadership and Generosity might be areas where your audience can relate to you. Hygiene and Poise are good values, but these may not be things you want to define your brand and, unless they are the topics of your books they may not rise to the top level of your brand values. Once you have your values defined, you may want to sit with them a day or two to make sure you are happy with your choices, and feel confident they capture those parts of you that you want to project to your target audience. Then put them on your worksheet. Next week we’ll pick up where we left off, using values to define your Core Brand Driver. And in the meantime, embark on an adventure in Irish history! Sharavogue is the award-winning story of a peasant girl who vows to destroy Oliver Cromwell during his march of destruction across Ireland in the 17th century, and her struggle for survival on a West Indies sugar plantation. 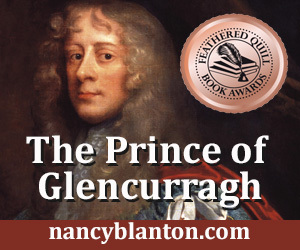 Winner of the Royal Palm Literary Award for historical fiction, it is available from online booksellers including amazon.com and barnesandnoble.com. Part 3 in series on personal branding If England's King Henry VIII had been an author, who might he have been? Authors, like royalty, can project certain images to create a persona in the minds of their audiences and the general public, to thereby be remembered and gain policy support, or book sales as the case may be. As noted in Part 1 of this series, the proliferation of social media apps today make it nearly impossible to project an inauthentic persona. The moment you thought you had created a good one, someone would post an instagram of you carrying out the garbage in your underwear. But King Henry was able to create and project a persona that met his needs, and the corresponding author that comes to mind for me is Ernest Hemingway. As young men, both Henry and Ernest were good looking with athletic physiques. Henry was known for having "an extremely fine calf to his leg," for example. Both played hard at sports, be it jousting or hunting, and both saw themselves as warriors. Both were interested in education and literature. Both married a few times. Both drank to excess. Both attained a "larger than life" persona that continued long after the men themselves had faltered due to illness and, well, bad behavior. Henry VIII valued education, religion, arts, architecture, innovation and ostentation. He used his physical size to advantage -- he was 6'2" at a time when most men were considerably shorter -- and in many cases his portraits show him taking up most of the canvas. In the background of some portraits he was surrounded by the cultural sophistication reminiscent of imperial Rome. He excelled at sports and held jousting matches, wearing his gilded armor, satin and pearls, as a way of showing his wealth, strength and power to visiting dignitaries. In architecture, the exterior of buildings included hundreds of busts, the laurel-wreathed heads of emperors, imperial authorities and military heroes, suggesting these heroes were the foundation upon which King Henry's Tudor dynasty was built. In art he was featured at the center of huge architectural structures in classical style, in at least one case receiving the water of life and the book of life directly from the angels, a clear reference to his religious persona as head of the Church of England with the divine right of kings. Later in life, even after a jousting injury and other health conditions changed him dramatically -- and even though the noble king was responsible for about 70,000 executions -- the glorious persona that he had created still permeated. Fans of the Tudors television series may recall in the last episode just before Henry dies, he orders the portrait artist Holbein to change his latest, and accurate, depiction of declining, sickly Henry into the standing image of the strong, virile (note codpiece), magnificent king he wanted his people to see. In part, I would say, the success of Henry's brand persona is that the powerful, charming, man's man image he created was something the citizens of his time wanted and respected in their king. It was an image that was easy to accept, and easy to follow because it met with their own values, and even in the face of horrible truths it was hard to let go. Sharavogue recently won first place for historical fiction in the Florida Writers Association Royal Palm Literary Awards. You can purchase a copy from online booksellers and at the Book Loft on Amelia Island, FL. I will be presenting at the Amelia Island Book Festival Feb. 20-21.